Students, faculty, and program managers attending #SACNAS2017 in Salt Lake City will have the chance to learn about the CCST Science & Technology Policy Fellowship! CCST will be hosting booth #1017 at the Exhibit Hall throughout the conference. Fellowship program manager Annie Morgan will be on hand with a number of fellowship alumni: Erika Bustamante ’12, Estevan Santana ’15, and Gabriella Nepomuceno ’16. The conference will take place from October 19th through October 21st. 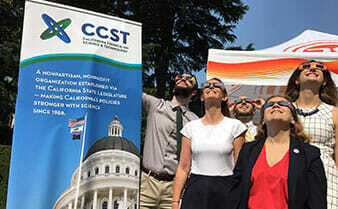 The CCST Science Fellows program offers scientists and engineers a year of public service and government leadership training, working as policy staffers in the California State Legislature. 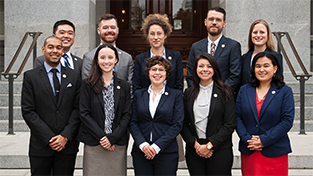 Coming to Sacramento with PhDs in a variety of natural and physical science disciplines, CCST Science Fellows have parlayed their fellowship experience to a variety of policy careers. 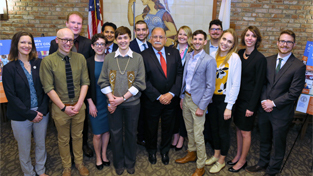 Erika Bustamante now works as Assistant Director of State Government Relations for Stanford University, while Estevan Santana currently serves the Office of the Director at the National Institutes of Health as a AAAS Science & Technology Policy Fellow. 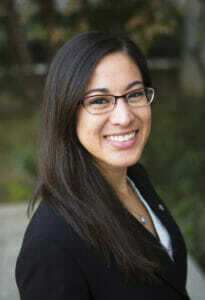 And Gabby Nepomuceno now works as a Strategic Program Development Team Analyst for the California Department of Toxic Substance Control (DTSC). Several CCST Science Fellows have been active in SACNAS activities during the course of their academic career. Tepring Piquado ’13 is a graduate of the SACNAS Leadership Institute and a former elected Board Member of SACNAS, and spoke at the 2017 March for Science L.A. as a SACNAS affiliate. Brandon Gaytán ’14 has also served as an elected Board Member of SACNAS, while Biswajit “Bish” Paul ’17 received the St Jude’s Research Hospital Award for Outstanding Research Presentation at the 2015 SACNAS National Conference. Applications for the 2019 Class of CCST Science Fellows open on December 1st, 2017. Come to booth #1017 (near the NSF booth) at the 2017 SACNAS Conference Exhibit Hall, and learn about the CCST Science & Technology Policy Fellowship. Talk with our fellowship program manager and fellowship alumni, and learn how becoming a CCST Science Fellow can open up avenues of opportunity in state and federal policy careers.